Basic physical mechanisms (J.P. Nougier). Epitaxy of wide band gap III-V materials by MOVPE and MBE (M. Heuken). Device simulation (C.U. Naldi, G. Ghione). Characterisation of mismatched epitaxial layers grown by metal-organic vapour phase epitaxy (A. Gustafsson). Noise devices: Definition, modelling (J.P. Nougier). Field effects transistors modeling and performance (Y. Crosnier, G. Salmer). Technology for III/V-Semiconductor HFET devices (W. Prost). Monolithic integrated circuit modelling (M.J. Howes). Millimetre-wave devices (J. Freyer). Heterojunction bipolar transistors: Technology, perormance and applications (A.J. Holden). Optoelectronic and photonic integrated circuits: Modelling and technology (R. Baets, P. Van Daele). Author index. Subject index. As is well known, Silicon widely dominates the market of semiconductor devices and circuits, and in particular is well suited for Ultra Large Scale Integration processes. However, a number of III-V compound semiconductor devices and circuits have recently been built, and the contributions in this volume are devoted to those types of materials, which offer a number of interesting properties. 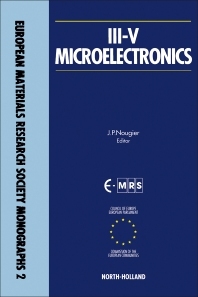 Taking into account the great variety of problems encountered and of their mutual correlations when fabricating a circuit or even a device, most of the aspects of III-V microelectronics, from fundamental physics to modelling and technology, from materials to devices and circuits are reviewed. Containing contributions from European researchers of international repute this volume is the definitive reference source for anyone interested in the latest advances and results of current experimental research in III-V microelectronics.